For those interested in continuing their education in photography, photo-eye has the most comprehensive listing of schools and universities with photography programs in the United States. Each listing is complete with the type of degree offered, links to program websites, number of faculty as well as maps to locate each school. The listing is a terrific resource for those who are looking for schools to consider as part of their continued education as a photographer, whether you’re a first-time student or transfer student or seeking either an undergraduate or graduate degree in photography. 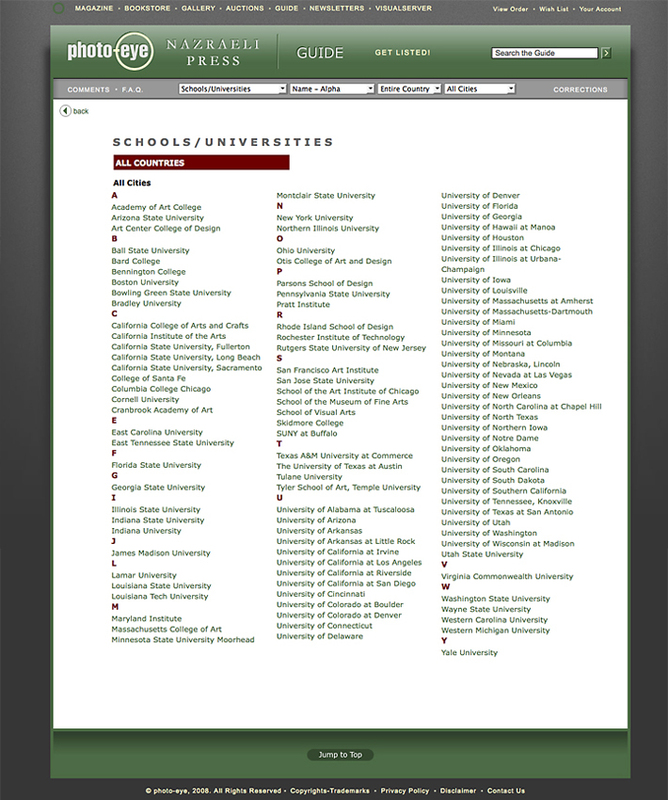 Click on photo-eye school/university listing for the complete listing of school/university links. There are many other resources available from photo-eye, including their bookstore with one of the most comprehensive offerings of photography books in the country, a website service (Visualserver), gallery, newsletter, photo book auctions and their USA Photo Guide.